1/29/09 - Jim asked me what blogging is about. Of course he knows full well. The flight here yesterday from D.C. had only one major trauma, that being the O.J. airport run I had to perform in Atlanta. It was warm and muggy, sort of like Hawai'i, but now I'm name dropping. We yacked and tasted and spent time with Johannes and Richard until the wee hours. Now it's today. Now, later, it's almost 4:00p. This morning there was an interesting master class with students and Lisa Kaplan, the pianist in the festival's featured chamber group, eighth blackbird which will perform on tomorrow night's concert. In another gathering, guest composer Christopher Theofandis discussed the compositions of student composers... interesting stuff. Alas, a panel discussion with the e.b. was poorly attended. 1/30/09 - Last night's opening concert was a strong starter for the large, evening performances in Opperman Hall. Attendance was quite good. Showcased were compositions by Christopher Theofanidis, Peter Lieuwen, Allen Anderson, Paul Lansky and Mikel Kuehn. 1/31/09 - Last night's concert in FSU's Opperman Music Hall might well have been the high point of the Fourteenth Biennial Festival of New Music here at the Florida State University in Tallahassee. [from program notes] Described by the New Yorker as "friendly, unpretentious, idealistic, and highly skilled," eighth blackbird promises - and delivers - provocative and engaging performances to its ever-growing audiences. Combining bracing virtuosity with a fresh and alluring sense of irreverence and panache, the sextet debunks the myth that contemporary music is only for a cerebral few. eighth blackbird is widely lauded for its performing style - often playing from memory with virtuosic and theatrical flair - and for its campaign to make new music accessible to wide audiences. 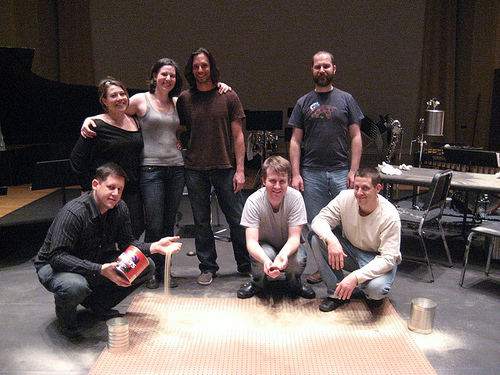 The group is in residence at the University of Richmond in Virginia and the University of Chicago.